Nordic skiers, even those who live in Oakland County, are often pleasantly surprise the first time they ski the trails at Independence Oaks County Park. Not because the trails are so well groomed or the lakes-and-woods scenery is so stunning in the winter but because of the change of elevation they encounter. There are some serious slopes at Independence Oaks. Who knew Oakland County could be so hilly? When there is sufficient snow, usually from early January to early March, the park grooms more than 7 miles of trail for both classic and skate skiing. Once groomed and tracked, these trails are open only to Nordic skiers but the park has three other winter trails; Habitat Trail, All Visitors Loop andRiver Loop, that are open to all activities including snowshoeing, walking and visitors with dogs. 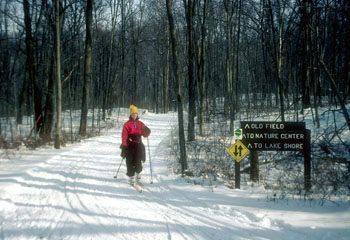 Most of the ski trails have a posted direction of travel but the Lakeshore Loop has two-way travel on the west side of Crooked Lake, allowing skiers to begin at either the Boat House that serves as the ski and snowshoe rental office in the winter or the Lewis E. Wint Nature Center parking lot. The park’s most challenging trails are Springlake Loop and Ted Gray Trail which are combined for a 3.6-mile loop from the Ski Rental Office and include seven downhill slopes including a wicked dogleg hill on Ted Gray. Lucky for beginners and novice skiers, Independence Oaks' most popular trail is Lakeshore Loop, an easy 2.4-mile run that is rarely out of view of Crooked Lake and features only two minor downhill slopes. The Ski Rental Office also doubles up as a warming center during the winter with heated restrooms while outside the park maintains a fire and picnic tables overlooking the skating rink. Both cross-country skis and snowshoes are available for rent when there is sufficient snow while on most Saturdays in January and February ski lessons are offered. Early and late in the season or during those January thaws it’s important to call the park office (248-625-0877) to double check if the trails are groomed or if the rental office is open. This 2.4-mile loop is rated Easy and is picked at the Ski Rental Office where you follow the tracks in a counter-clockwise direction. Lakeshore has only two short downhill slopes, one at the northeast corner and another at the southwest corner, and is rarely out of view of Crooked Lake. Along much of the east side you follow a low bluff above the lake, on the west side you are often skiing right along the lakeshore. In less than a mile from the Ski Rental Office you reach post No. 5, marking the junction where Springlake Loop peels off and heads into the hilly interior of the park. At this point Lakeshore Loop is two-way travel for the next 0.8 mile until you reach post No. 11, where Springlake Loop merges back into the trail. This is Independence Oak’s most challenging route and the reason it offers some of the best skiing in Southeast Michigan. The 3.2-mile Springlake Loop is rarted More Difficultand begins at the Ski Rental Office. It utilizes Lakeshore Loop until post No. 5 where it heads west (right), crosses the park road and then heads into the hilly backside of Independence Oak. In the next 1.77 miles you enjoy four downhill runs, including a furious one down North Hill. The heart of the loop, however, is the long climb to the top of South Hill, the highest point in ther park, and the equally long descent down it where you end at post No. 11, the junction with the return to the Lakeshore Loop. If you find the first half of Springlake too challenging, you can depart the loop before climbing South Hill at post No. 15. Head east (left) on Old Field Trail, an easy and relatively level route, and within 0.38 mile you'll reach Lakeshore Trail at post No. 9. To lengthen the loop and to make it even more challenging add Ted Gray Trail. 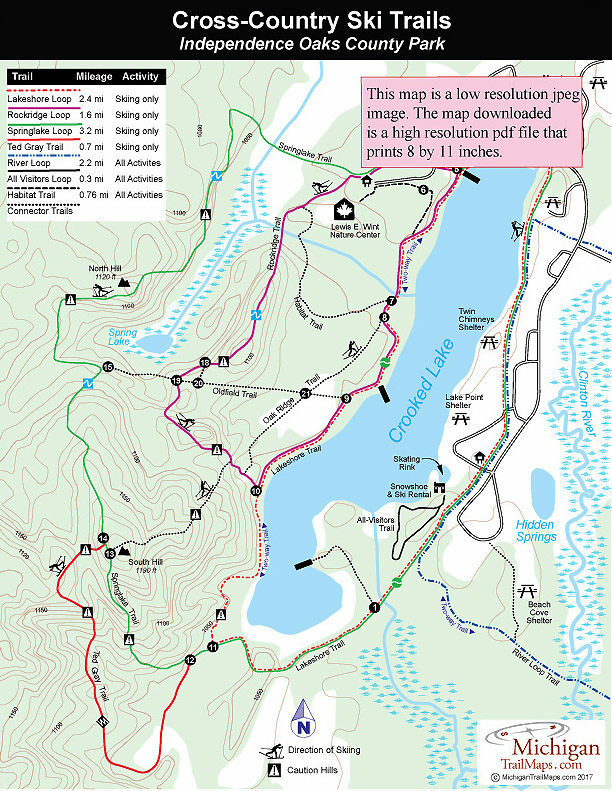 The 0.7-mile side trail, rated Most Difficult, is picked up at the post No. 13, the top of South Hill. It includes three descents, the second a wicked dogleg that should be avoided during ice conditions or when the base is thin, exposing clumbs of dirt and leaves. More than one ski has been snapped on this hill. Ted Gray makes Springlake Loop a 3.6-mile ski. You can also begin in the nature center trailhead and return along the two-way track on the west side of Crooked Lake for a 3-mile outing. This loop begins at the nature center trailhead and is rated More Difficult. Rockride includes a long climb in the beginning followed by a descent of the ridge. Another climb to the wildlife viewing platform follows. You then descend to post No. 10 along the Lakeshore Loop. The descents can be fast at times but are not nearly as challenging as those on Ted Gray or the Springlake Loop. At post No. 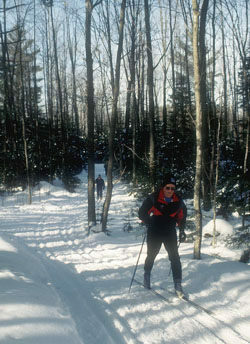 10 you can head north (left) on the two-trail to return directly to the nature center trailhead for a 1.6-mile ski. Or you can head south (right) and complete the rest of the Lakeshore Loop around Crooked Lake for a 3.5-mile ski. Independence Oaks features a boat launch for non-motorized boats and seasonal rowboat, canoe, kayak and pedalboat rentals on Crooked Lake. On the east side of the lake are picnic areas, rental shelters, a ball field, sand volleyball courts, playground equipment, horseshoes pits and a beach with a bathhouse on Hidden Springs. In the wionter the park offers cross-country skiing, ski rental, ice skating, ice fishing, warming shelters. Enlarged to 8300 square feet in 1997, Lewis E. Wint Nature Center is one of the most impressive facilities in southeast Michigan. Exhibit areas lead you through four theme rooms devoted to water, the sun, weather, and geology. The park is open year-round from a half hour before sunrise to half hour after sunset. Lewis E. Wint Nature Center is open daily 10 a.m.. to 5 p.m.. Tuesday through Saturday and noon to 5 p.m. Sunday and holidays. A motor vehicle daily permit or an annual Oakland County Parks pass is required to enter the park by both county residents and non-residents. Independence Oaks is located near the village of Clarkston and can be reached from I-75 by departing at exit 89 and heading north on Sashabaw Road for 3.5 miles. Once inside the park, follow signs to the boathouse that serves as thge warming center in the winter. Contact the park office (248-625-0877) or the Lewis E. Wint Nature Center (248-625-6473) or the Oakland County Parks website (www.destinationoakland.com).